This tour was one that I had wanted to do for a long time. To cross Europe seemed like a fine project, but a bit daunting so I set off with the aim to reach the source of the Rhine River in Switzerland. Eurovelo 15 is the Rhine Cycle Route following Europe’s biggest river from the mouth near Rotterdam to the source just above Andermatt in Switzerland. It is mostly flat on great cycle paths along this busy river. After reaching Basel however it climbs slightly more to Lake Constance (Bodensee), and then up the Grisonian Rhine Valley from Chur. Its a fairly steady climb with the final kilometres winding steeply to the Oberlap Pass at 2044m. The source of the Rhine can be reached from here but only on foot. The descent from the pass to Andermatt is a great ride with Andermatt being well connected with public transport should you wish to end your journey here. The next part of the tour started after a few days in Andermatt. 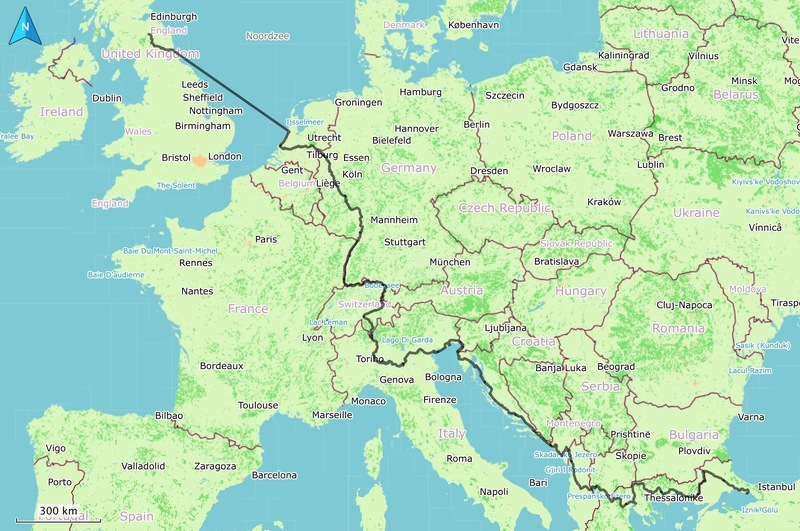 Joining Eurovelo 5, it was over the Gotthard Pass and into Italian speaking Switzerland, down to Monza and Milan and along the River Po and Northern Italy to Venice on Eurovelo 8. The third part of the tour continued down the coast of Slovenia, Croatia and Montenegro. Into Albania and its capital, Tirana after which I crossed Northern Greece and into Turkey. The trip ended in Istanbul where Torla the trusty Thorn Raven Tour and everything else were packed up for the flight back to Edinburgh. By dividing the trip into three parts it did not seem as daunting! Again I used a Garmin eTrex 30 GPS and a Cateye CC-M100W cycle odometer to record my route. Below links will soon be added to the GPS tracks for each day of cycling. You will be able to click on each part to obtain a track, elevation and other statistics. At the moment I can’t seem to upload the GPS tracks to Garmin Connect but will put them here when the technical problem is resolved!